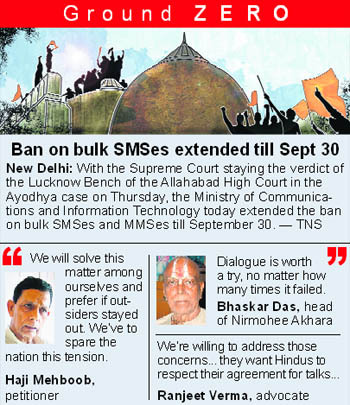 Tired from six decades of embattlement over ownership of the disputed Ram Janmabhoomi-Babri Masjid site, Hindu and Muslim contesters in the case appear to be homing in to the prospect of peace by advocating talks. In doing so, they hope to honour the sentiment of Ayodhya, fatigued with underdevelopment and curfews, twin legacies of the protracted legal battle. The high-powered committee of Sants that met under the aegis of the VHP here today belied all hopes of the Supreme Court to arrive at a negotiated settlement. After a day-long meeting, prominent sadhus and Sants announced that whatever be the High Court verdict, they would not allow construction of a mosque in place of the Babri Masjid vandalised and demolished by kar sevaks at Ayodhya on December 6, 1992. India’s defence preparedness lost some sheen today when an IAF MiG-27 crashed in West Bengal - the third in this calendar year and crucially the fifth after the entire fleet of MiG-27 was ‘upgraded’ last year. The Union Cabinet today gave its approval to a Bill to accord legal backup to the project providing unique identification numbers, renamed Aadhaar, for residents. The approval for the Bill titled the National Identification Authority of India Bill, 2010 came at the meeting of the Cabinet here chaired by Prime Minister Manmohan Singh, said an official release. Aamir Khan’s “Peepli Live”, a satire on media’s trivialisation of farmers’ suicide, has been selected as India’s official entry at the next year’s Oscars in the Best Foreign Film category. ‘“Peepli Live’ has been selected as India’s official entry for the Oscars out of 27 films,” Supran Sen, secretary general of the Film Federation of India, said. Written and directed by debutant Anusha Rizvi, the small budget film stars theatre actors and was shot in a small village in Madhya Pradesh. Producer Aamir said he would ensure that the film is seen by the Academy members and it gets a good publicity during the awards next year. The Gujarat High Court today formed a new three-member special investigation team of IPS officers to probe afresh the 2004 encounter of Mumbai teenager Ishrat Jahan and three others, and rapped the state government for not wanting "outsiders" to handle the case. The All Assam Students’ Union (AASU) today called off the road blockade against Nagaland following a late last night discussion with Naga Students’ Federation (NSF) leaders where the latter assured the AASU to ensure exemplary punishment to guilty Nagaland Armed Police (NAP) personnel involved in assaulting AASU demonstrators inside Assam territory on September 15 last. The Delhi High Court today reserved its order on former Uttarakhand Chief Minister ND Tiwari’s petition challenging imposition of a cost of Rs 75,000 on him by a single Judge Bench of the court in a paternity suit filed by a man claiming to be his biological son. The Delhi High Court today quashed the corruption charges filed against two journalists for conducting a sting operation in 2005 against MPs who took money for asking questions in Parliament. The court observed that people had a fundamental right to have a “clean incorruptible judiciary, legislature, executive and other organs”. The Maharashtra Police is on the lookout for Nitesh Rane, son of Maharashtra Revenue Minister Narayan Rane, and at least two others for an alleged attempt to murder a member of Nitesh’s NGO, Swabhiman Sanghatana. Janata Party chief Subramanian Swamy has moved the Supreme Court seeking its directive to Prime Minister Manmohan Singh for allowing the prosecution of Communications Minister A Raja for alleged corruption in the 2G spectrum allocation that resulted in a loss off Rs 70,000 crore to the government. The Supreme Court today closed a PIL case on the issue of suicides by farmers in distress across the country, observing that it “cannot monitor” the implementation of any agriculture policy across the country. A three-member Bench, headed by Chief Justice SH Kapadia, clarified that it did not have the expertise to review the existing agriculture policy and suggest changes “so that there is no recurrence of suicides by farmers in any part of the country”. The Bench, which included Justices KS Radhakrishnan and Swatanter Kumar, passed an order acknowledging the importance of the issue raised in the PIL filed in 2006 by one Sanjeev Bhatnagar. Three persons have been detained following recovery of six crude bombs from Vadodara today, the police said. “The bombs, which weighed 1.1 kg each were recovered from a bag near a religious place in the Yakutpura area,” city police commissioner Rakesh Asthana said. “We raided the place following information from the Intelligence and found a bag,” he said. At least 12 persons were injured when the engine and a bogie of the Kasganj-Lucknow Rohilkhand Express derailed near Kasganj railway station early today. In a major development today, one of the main Muslim plaintiffs, for the first time, admitted that solution to the issue was critically important and people of Ayodhya would find it. So far, Muslim petitioners contesting under the umbrella of Sunni Central Wakf Board have ruled out talks, as have others despite Allahbad High Court's attempts. Mehboob’s rare confession was matched by main petitioners on the Hindu side - Nirmohee Akhara, whose head Mahant Bhaskar Das said dialogue was worth a try, no matter how many times it failed. The Akhhara will on September 28 seek judicial mediation for talks, with advocate Ranjeet Verma reasoning, “Even if the High Court had ruled, its orders, whoever they favoured, could never have been implemented without the consensus among warring parties. We will propose a committee of retired judges to mediate between both sides, which find it difficult to take the lead in this sensitive issue.” Akhara has been talking to Muslims who are learnt to have voiced some concerns. “We are willing to address those concerns. For one, they want Hindus to respect (and not treat as victory) their agreement for talks, whenever they happen,” Verma said. The Supreme Court had yesterday admitted a petition by Ramesh Chandra Tripathi seeking one more opportunity for negotiated settlement and stayed the Allahabad High Court from delivering its judgment due today. Today, however the Sants and VHP president Ashok Singhal clarified that nobody approached them nor did they approach the Sunni Wakf Board, which owns the title of the land on which the Masjid stood once but is now the makeshift temple of Ram Lalla Birajman and ruled out any negotiated settlement. This meeting was originally slated to react to the Allahabad HC judgment and in so far as that made no difference to the VHP plans. Meanwhile, the BJP, too, deliberated on the apex court’s move today and Leader of Opposition in the Rajya Sabha and leading legal counsel Arun Jaitley spelled out a very measured but definite displeasure of the party against this judicial delay. Meanwhile, a ‘Prithvi’ missile failed to take off from its launch site in Orissa. For the missile programme, this was the third failure within a year. The MiG-27 crash is a serious loss, as the entire fleet of about 100-odd ground attack fighters comprising five squadrons had been grounded in February this year following a fatal crash in which a Squadron Leader was killed. The fleet was made airborne in June this year after clearing all tests. Today’s crash, in which the pilot ejected safely, was the second since then. 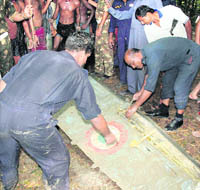 In July one of the planes crashed killing three civilians in Jalpaiguri in West Bengal. A major engine snag was the suspected trouble when the fleet was grounded. The flaw seemed to have crept during the overhauling of the aircraft by the Hindustan Aeronautics Limited (HAL). The entire fleet had also completed an indigenous upgradation programme last year that was executed by HAL. Notably, in 2009, two MiG-27s crashed months after the upgradation was completed, making today’s crash the fifth since the multi-crore programme was carried out. The fighters were equipped with modern avionics and a pilot-friendly cockpit with multi-function displays and a head-up display (HUD) while the engine, the R-29, was the same as before. Following the February grounding, the MiG-27s were taken off the biggest IAF exercise, the Vayushakti, in the end of February. Separately, India’s indigenously developed nuclear capable Prithvi-II ballistic missile failed to take off during a user trial today and a “manufacturing defect” is being suspected for the aborted launch. The nine-metre long state-of-the-art missile, which has already been inducted into the Armed forces, was planned as user trial by the specially formed “Strategic Force Command” (SFC) of the Armed Forces. The previous four user trials of the missile were successfully conducted during the last 12 months from the same site - the last one being on June 18 this year. This is the third time that a missile launch has failed in the country in the past one year. The night test-firing of the Agni-2 missile failed on November 24 last year but successfully test-fired on May 17 this year. The Ballistic Missile defence shield test in which a Prithvi missile was used had also failed on March 15 this year, but was testfired successfully later. The Cabinet also decided to give the go-ahead to the introduction of the Bill in Parliament in the upcoming winter session. “The Bill seeks to constitute a statutory authority to be called the National Identification Authority of India (NIAI) and lay down its powers and functions, besides the framework for issuing unique identity (UID) numbers to be known as Aadhaar numbers,” the statement said. The law will empower the NIAI to issue Aadhaar numbers to individuals residing in India ,besides certain other classes of individuals, the manner of their authentication and other related and incidental matters, the statement added. The project will involve an expenditure of Rs.3,023.01crore which includes a sum to fund the various components of the project by March 2011 and recurring establishment costs for the entire project phase of five years ending March 2014. “The UID project is primarily aimed at ensuring inclusive growth by providing a form of identity to those who do not have any identity,” the release said, adding that it seeks to provide Aadhaar numbers to the marginalised sections of society and thus would strengthen equity. Apart from providing identity, the Aadhaar number will enable better delivery of services and effective governance. The SIT constitution was ordered by a Division Bench of Justices Jayant Patel and Abhilasha Kumari while hearing a petition of Gopinath Pillai, father of one of the victims, Javed Ghulam Sheikh, alias Pranesh Pillai. Meanwhile, Nagaland has suspended the company commander of the12th IR battalion 'Bravo' involved in the incident and announced Rs 5 lakh ex-gratia to the injured. The indefinite road blockade was called by the All Assam Students’ Union (AASU) against Nagaland on September 18 demanding “exemplary” punishment against Nagaland Police personnel. The judge had slapped the cost on August 13 while dismissing his plea for deletion of some details from the paternity suit filed by Rohit Sekhar (32), claiming to be the son of the Congress leader and Ujjwala Sharma, also a party leader. Delhi police had sought to justify the case against the journalists, Anirudh Bahal and Suhasini Raj, contending they had offered bribe to MPs, which amounted to encouraging corruption. The airing of tapes on TV channels and then by deposing truthfully before the two Committees of Parliament clearly showed that their intention was to expose corruption and not to commit a crime, Justice Shiv Narayan Dhingra said in the verdict. Charging them with corruption would “amount to travesty of justice and shall discourage the people” from performing their duties enjoined upon them by the Constitution as well as criminal laws, the Judge noted. In his police complaint, activist Shamim Jamaluddin Shaikh alias Chintu alleged that Nitesh fired at him from a revolver on Thursday. Shaikh said that he had gone to Nitesh’s office yesterday around 4 pm to congratulate the youth leader on a recent birth in the family. Shaikh’s father Mazar and wife Simran told reporters that Nitesh, who was upset over a different issue, pulled out his gun and fired two shots. “When I went to the office (of Nitesh) in Khar with sweets in my hand, I was cornered by Nitesh’s PA, one Zaheed and four bodyguards. Nitesh tried to kill me, he said showing the bullet injury on his cheek. He should be arrested immediately,” Shaikh told reporters. Both bullets missed after Shaikh ducked, but one grazed his jaw and injured him. Both alleged that Shaikh then ran out of Nitesh’s office and drove to Andheri where he was admitted to hospital. Meanwhile, the wife of NGO activist Shamim Sheikh on Friday demanded a CBI enquiry into the incident. The government and the CBI had not initiated any action against Raja despite the fact that the Chief Vigilance Commissioner (CVC) and the Comptroller and Auditor General (CAG) had made out a prima facie case of corruption in the spectrum allocation, Swamy said in his appeal. Contending that “corruption is an urgent public issue”, he said it should not be possible for ministers to “escape or postpone answerability” in such cases just because of the Prime Minister’s failure to accord sanction for prosecution. The investigation in the case should not be “choked or scuttled” simply because it was not politically expedient. “Political expediency has no place in deciding whether prosecution under the Prevention of Corruption Act should or should not take place,” he argued in the appeal against the High Court order rejecting his plea. On August 18, the HC had dismissed his petition observing that the CBI investigation was already on and that the court had earlier refused to monitor the case. Swamy, however, clarified that he did not want the HC to monitor the investigation. Although the “petition is genuine”, the court noted from the case records that the government had set up an expert group to look into the farmers’ grievances raised in the PIL. The expert body had given a large number of suggestions, the Bench noted. Additional Solicitor General Harin Raval said the government had, among other things, waived farm loans worth Rs 65,000 crore to alleviate farmers’ problems. The petitioner, however, said the government had failed to go into the issue at the micro-level and cited information tabled in Parliament to show that as many as 1.82 lakh farmers had committed suicide in 10 years (from 1997 to 2007). “Whether those suggestions are adequate or not cannot be gone into by this court under judicial review,” the Bench ruled. “Under the circumstances, we are of the opinion that the writ petition stands worn out” and as such was being disposed of, the order said.